The Kermode bear is also known as the spirit bear or ghost bear because of its rarity and because a small percentage of them have white coats. The species Ursus kermodei was named in 1905 in honor of Francis Kermode, a zoologist who conducted the first studies into the origins of these bears. In 1928, the Kermode bear was reclassified as a subspecies (Ursus americanus kermodei) of the American black bear. It is believed that Kermode bears evolved over the last 10,000 years from black bears that became isolated more than 300,000 years ago. Kermode bears can only be found in what is known as the Great Bear Rain Forest located in west-central British Columbia and a few adjacent islands. They are so rare that even people who live in the region rarely see them. The highest concentration of Kermode bears can be found on and around Princess Royal Island. The islands and surrounding areas are also home to other black bears and grizzly bears. 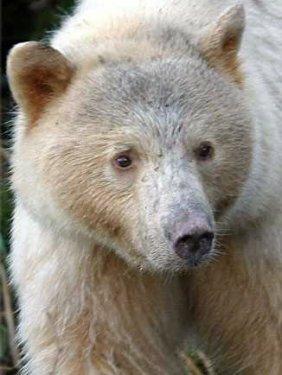 White Kermode bears or spirit bears are the result of a recessive gene that is carried by approximately 10 percent of Kermode bears. 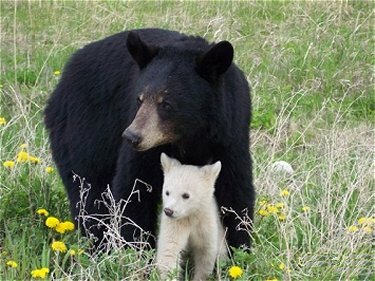 Two bears carrying this gene can produce a white cub. Kermode bears on average weigh about 300 pounds. They may appear white, cream-colored, orange, gold, or gray, though most of them are totally black. 95 percent of the Kermode bears' diet is made up of salmon which is abundant on the islands. Salmon is very important when it comes to the bears' fattening up for hibernation. They also feed on green plants, berries, nuts, and insects. Just like other black bears, Kermode bears are slow at reproducing. They hibernate in hollowed-out old trees usually from November to March. The mother will give birth to anywhere from 1 to 4 cubs while still in hibernation. They weigh about 1/2 pound at birth and remain with their mother for about 2 years. As a result of habitat loss, logging, mismanagement, and hybridization with the mainland black bears that don't carry their unique gene, the Kermode bear is facing eventual extinction. Of an estimated 1,200 Kermode bears, fewer than 200 are white. Regardless of the Great Bear Rainforest Agreement which was written up in 2006 by the government of British Columbia in attempt to limit logging within the area, the Kermode bear still possesses no legal protection as its habitat continues to dwindle.